Instructions for basic arithmetic operations with a "Comptometer" type calculator. These instructions for performing the basic 4-functions on a "Comptometer" type calculator are taken from the operating instructions of the Sumlock machine manufactured by the Bell Punch Company, though they can be applied to Comptometer-type machines in general. Note that each key of this "full-keyboard" machine has two numbers. The larger-sized number is used for addition and multiplication, whereas the smaller-sized number (which is the "nines complement") is used in subtraction and division. The little buttons at the bottom of each column of keys are the "subtraction buttons". The Bell Punch Company specialised in simpler machines with "abbreviated keyboards", as illustrated below. These only have keys up to 5 in any column, do not have the small numbers on the keys or the subtraction buttons, and were designed mainly for addition, as described below. Comptometer operators were taught to use their machine in the same way that typewriters and computer keyboards can be operated using the "touch typing" technique. Here you do not look at the keys but move the fingers to the correct keys using touch. An important feature of Comptometers, which is widely used in these instructions, is that keys in different columns can be pressed simultaneously. So to enter 123 the fingers of one hand are placed on the 1, 2, and 3 keys of adjacent columns and then all fingers are pressed at the same time. "It is important that the operator does not look at the keyboard when adding. Keys Nos. 1 to 5 only are used in addition. This enables greater speed as it is quicker to strike two keys with the hand practically stationary than to move the hand to a distant key. The machine is operated by pressing one key [in any column] at a time. Should two keys in the one column be accidentally pressed the lower key only will register. The number 6 is registered by pressing 3 twice. The number 7 is registered by pressing 4 and then 3. The number 8 is registered by pressing 4 twice. The number 9 is registered by pressing 5 and then 4. Ten pence is registered by pressing 5 twice. Elevenpence is registered by pressing 4 twice and then 3. The answer is shown in the glass panel at the foot of the machine. To clear the figures pull the Clearance Lever forward and release." "Large figures on the keys are used for multiplication and the full complement of keys 1 to 9 in each column are used. "RULE. USE SMALL NUMBERS ON THE KEYBOARD LESS 1, i.e. when subtracting 73, depress small 7 (in the tens column) and the small 2 (in the units column). When the divisor does not go into the dividend the exact number of times, it will be necessary to divide right across the keyboard." After reading these instruction I feel very glad that electronic pocket calculators were developed. Subtraction and division appear to be very prone to errors if the person lost concentration. You can appreciate why there were may "colleges" teaching Comptometer techniques run by the manufacturers. "How the Comptometer works" - animated explanations of the Comptometer mechanism. "The Comptometer Super Totalizer, a mechanical calculator" - shows the basic operation of a Comptometer. "Comptometer Arithmetic" - addition, subtraction, multiplication and division. For comprehensive instructions on using decimal Comptometers see the book "How to use the Calculator and the Comptometer" by James R. Meehan, 1952. This is available to download at https://archive.org/details/comphowtouse. 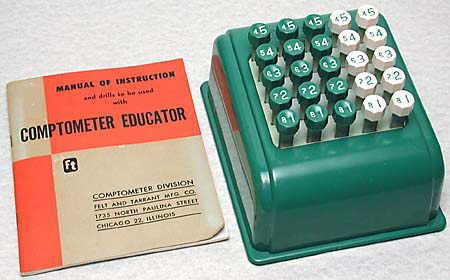 The photograph above shows a "Comptometer Educator", which is a dummy abbreviated Comptometer used for training purposes. It is used to practice entering complete numbers in one go using all the fingers of the hand. 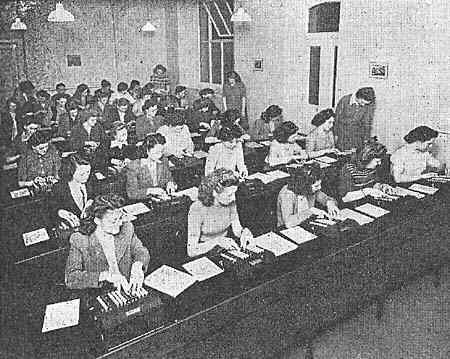 This photograph is from the journal "Office Magazine" for January 1955 and has the caption "Over 180 girls a year pass through the Liverpool school for Comptometer operators run by Felt & Tarrant Ltd. Course normally lasts three months, but there is a shorter course, provided free, which covers three weeks and deals with one specific application of the Comptometer". 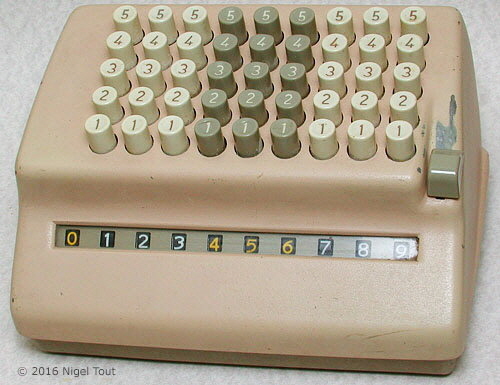 Comptometers were actually very fast in operation when adding up lists, such as required in accounting. 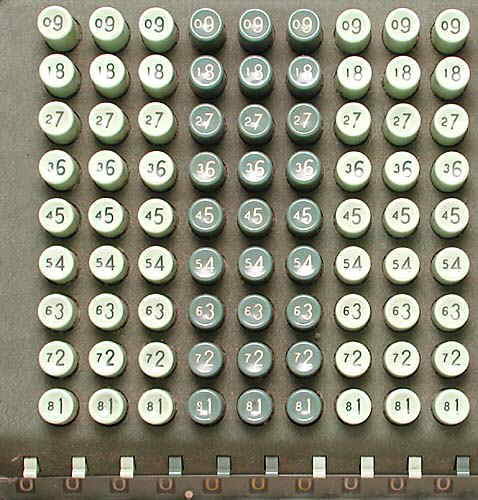 Operators were specially trained to enter each complete number by pressing multiple keys in different columns in one go using separate fingers. In other words the digits were entered in parallel, the mechanism being able to cope with this.